I was surprised to learn that there are at least 32 songs about “meeting in the middle”. Don’t believe me? You can check it out here for yourself. Meeting in the middle is just another way of saying “meet me halfway” or “compromise”. The word compromise may feel a bit undesirable – after all, it implies that you will have to give something up. In reality, without a compromise, two opposing people, ideas, or ways of doing something are doomed to fail. In that context, compromise sounds pretty sweet. The inability to compromise – isn’t that what we’re witnessing with the talks about the wall between Trump and Congress right now and the partial government shutdown? Enough politics – that’s not really my thing! 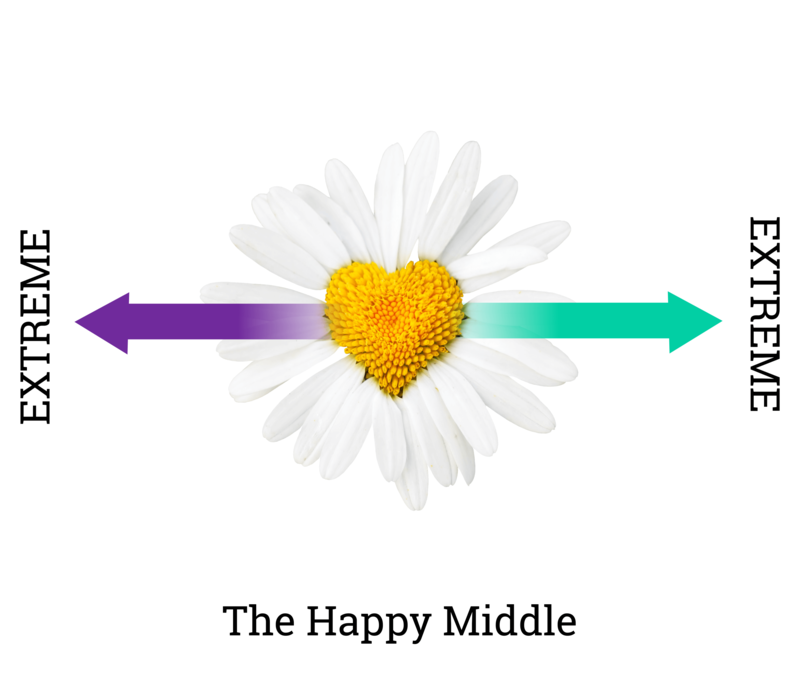 What I really want to share with you are the benefits of operating in the “happy middle” – the place of compromise. Compromise: to find or follow a way between extremes. There are numerous extremes that you and I operate in that do us no good! Take eating in a healthy way. You might starve yourself, eat nothing, or indulge in ridiculously small portions. Or at the other end of the spectrum, you might engage in binging, eating emotionally, or over indulging in harmful options. Maybe you are one who has the healthy eating thing down, but ignores exercising altogether or perhaps you practice excessive exercise. For many leaders and professionals, working 24/7 is an extreme! Perpetually working actually undermines your effectiveness and keeps you from participating in other life giving activities that would enhance your work, not to mention the rest of your life! Here’s one more extreme I frequently see. Rather than living in the “happy middle’ and being present, brimming with peace, joy, and confidence, I see people bogged down by guilt and shame – living in the past. Or at the other end of the spectrum, overwhelmed by anxiety and stress – living in the future. Being stingy or you might call it frugal with time, money, and resources. On the flip side, being careless, overly generous with your time, money, and resources. Even good things can be negative in extremes; activities like reading. If you never read you are doing yourself a disservice. If you read all the time, you might be escaping and that’s not so great. Being an under-doer, idle or apathetic is not so awesome. And neither is overdoing or striving! 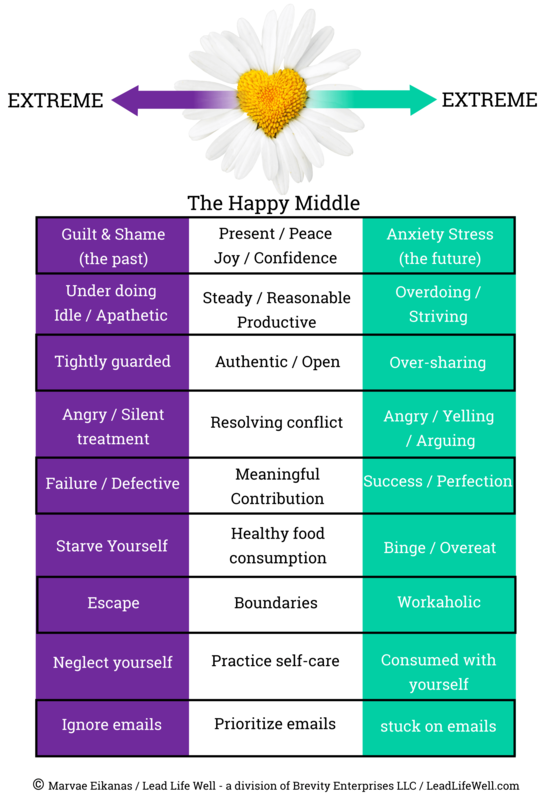 Remaining in the “happy middle” is no easy task but offers rewards well worth the effort! So what’s it take to creep back to the happy place – the middle? The very first step is realizing that you are engaging in extreme behavior. Sometimes your language clues you in to the fact that you are operating in extremes. Words like…always, never, perfect, impossible, totally, entire, all, everyone, awful, horrible, terrible, ruined, disastrous, furious, livid, nightmare, everything – can you think of anymore? 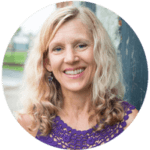 Once you realize that there are extremes in the mix, then you can examine the beliefs that are perpetuating the behavior that is holding you hostage in extreme-land. Let’s take the workaholic for example. The Lie: I must work long, hard hours. 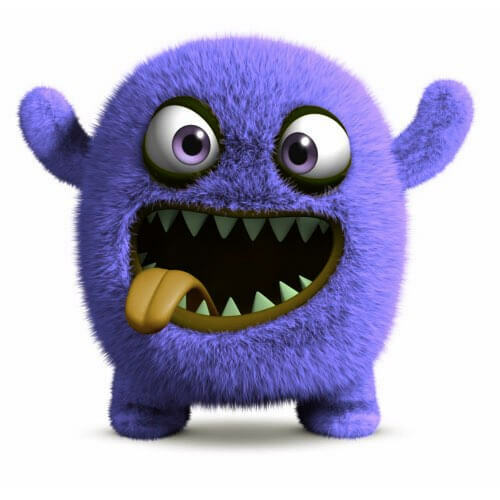 Trust me; your Fear Monster is fooling you! He is trying to convince you that you are not enough, therefore, you MUST work long and hard to be enough. Or if your Fear Monster is you don’t matter, he might tell you that in order to be significant, you must work long, hard hours. Is your Fear Monster I am rejected? Then he’s repeatedly mentioning to you that working long, hard hours is necessary so that people will like you; your boss, co-workers, or maybe even your parents or friends will be impressed and not reject you. Everyone’s Fear Monster is different. What is he repeatedly whispering to you? It’s hard to admit that you are participating in extreme behavior; even harder to admit that you can’t fix it on your own. Any time you operate in extremes, you have forgotten how loved you are by God. He doesn’t just put up with us. His love is indescribable, immense, and unconditional. He loves us the way you’ve always wanted to be loved: sacrificially! He created you to BE something amazing – something that reflects Him. And when you know you are loved, deeply loved, you are free to BE. No striving or giving up, just BEing. No perpetually being a couch potato or working like a mad man (or woman!). Doing life from that loved place is very freeing! It’s a happy place…the middle! Love isn’t something to be hoarded. It’s something to be given away. You have your own unique way of expressing His love; reflecting His love and passing it on to others. It’s what keeps you firmly in the middle! Steady, productive, and confident and enjoying peace, joy, safety. Have you noticed that when you drift from the middle these desirable qualities disappear too? When you live FROM Him, rather than FOR Him it changes everything. His love fills you and enables you to BE who He created you to BE and to stay in the “happy middle” where you no longer have to stay stuck or keep on striving. It diminishes those “extreme” behaviors! The drift is real! Without regularly connecting with Him and His love, you will drift right back to those extreme ways of doing life. That’s not beneficial for you, your work, or those around you! How are “extreme” behaviors affecting you? Timely advise! The new year can bring extremes in resolutions made. I want to be aware of how I am setting goals that could be extreme. It seems I can be one extreme or the other at times! Thanks for the chart, I will print that out to remind me to check my position and keep a healthy balance! You are so right. You can ignore setting goals or set goals that are unattainable. Either can be discouraging and self-defeating. That’s another reason SMART goals (Specific, Measurable, Attainable, Relevant, & Time-Bound) are helpful. Praying for an amazing year of balance for you in 2019 Cindy!